The halls of Congress are buzzing about, and momentum is building for, yet another tax cut. Truly. Not kidding. No, we don't mean making permanent the tax cuts for individuals that were part of December's tax "reform" but are due to expire after eight years. We mean something quite different. Bush and Republicans in the 107th Congress had already passed two sweeping tax cut bills that  along with the Iraq War  turned a $300 billion budget surplus under Clinton into a $470 billion deficit by 2004. And now yet another tax cut? Have we decided to go for broke? The plan is to index capital gains to inflation. Meaning? When you sell an asset  shares in a company, real estate  you are taxed on the difference between what you sold it for less what it cost. But if you've held the asset for any length of time, your profit will have been eroded by inflation. With inflation factored in, you might even have lost money. Yet you will be taxed on the full sell-less-cost differential as if inflation didn't exist. So where's the fairness in the government taxing the nominal profit when in fact that's not its true worth? Governments have a hand in that inflation. They have the power to control the money supply and set interest rates to prevent that inflation. Our government even promotes inflation; the Federal Reserve considers 2% a year to be desirable. Indexing to inflation already exists. Introduced in Reagan's tax reforms, one sees it in the year-to-year changes in the dollar thresholds of the tax percentage brackets (for example, in 2016 the 35.0% rate kicked in for earnings of $151,200; that was raised to $153,100 in 2017 because the dollar was worth less). But nothing was done for capital gains and Republicans want that fixed. 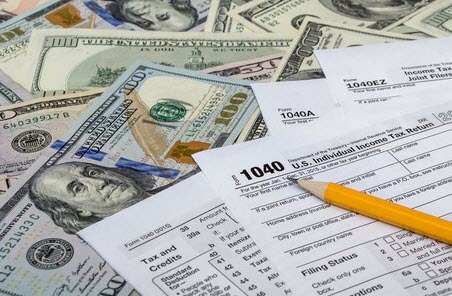 The goal now is to let us adjust the cost of an asset we are selling for the inflation that has occurred since buying, and to subtract the cost in current dollars from the selling price to arrive at true profit (or loss) in our tax returns. Democrats are averse to yet another tax windfall for the wealthy  10% of the public own 40% of all corporate stock  aggravating the deficit still further. But the newest argument on the right is that no law is needed from Congress. There's a paper making the rounds that says the Internal Revenue Code does not define "cost" as having to be the original price. They say that President Trump could simply decree as a regulatory change how the IRS is to treat cost hereafter. Of course, no mention at all is made of the tax breaks that capital gains already receive. Tax on income ranges as high as 37% but, depending on size of income, the tax on capital gains is no more than 23.8% , 20% for most, and only 15% for households earning from $77,200 all the way to $479,000. So, Democrats, as indexing cost for inflation is way overdue as a matter of fairness, why not go along, but in reciprocal fairness, why not insist that that capital gains be taxed at the same rates as all other income? Even Ronald Reagan thought that proper. Why is it fair or proper for the wages of labor to be taxed higher than profits from passively invested money? Is any attention being paid to what has resulted so far from the end-2017 tax cuts? The decline in revenue flowing to the government, combined with increased spending, has caused the deficit to explode. In the first eight months of the 2018 fiscal year (which began October 1, 2017), the deficit is up 23% according to the Treasury Department. The government took in $532 billion less than what it spent, compared to a deficit of $433 billion for the same period last year. The deficit for the full fiscal year  $666 billion in Obama's last year  is on track to reach just under $1 trillion. Over the next decade, barring change, the deficit will average $1.2 trillion every year. The national debt  the accumulation of all annual deficits  is now $15.7 trillion. That's 78% of the gross domestic product- the total of what everyone in the country produces in a year. At the current pace, which includes nothing done to rein in entitlements, the annual deficit will climb to $28.7 trillion ten years out, which will mean a national debt just shy of 100% of GDP. The Congressional Budget Office makes such projections, but it is obliged to base them on "current law"  the spending bills that have been passed by Congress. Their estimates therefore assume that the tax cut for individuals sunsets after eight years, per the Tax Cuts and Jobs Act passed in December. But, as with the 10-year sunset of the Bush 43 tax cuts, Congress can be expected to make them permanent rather than face constituents at the polls to explain why they've allowed taxes to rise to their former levels. Second, the current $1.3 trillion bill expires after two years. But as with individual tax cuts, Congress is likely to continue the high level of defense spending and, in return, Democrats will insist on maintaining social spending. Continuing current spending levels will add another $2.6 trillion of deficit over the decade. With both these changes from current law, out go the CBO estimates. Instead we will see the accumulated debt pushed to 105% of GDP, a level seen only once in our history and that was World War II. We are spending insanely in peacetime. And none of these forecasts consider what havoc President Trump's tariffs will unleash. No attention is paid to the knock-on effect  what the consequences will be for people who don't eat in the White House mess where the food never runs out. Reduced economic activity leading to job loss and further tax revenue shortfalls from businesses and individuals alike would seem to be inevitable in a tariff war, especially in one in which Trump shows signs of going all in on everything we import. And yet, Congress is saying let's cut taxes some more! are the tax cuts fulfilling their promise? The notion was that a flood of cash freed up by lowering taxes would spur growth. Corporations would invest in plants and equipment, boosting productivity, and greater profits would follow. Some of that would show up in wage gains for workers, who would pay more in taxes to offset the revenue loss caused by the tax cuts. True to expectations, corporate executives in a survey earlier this year said they planned to increase capital spending an average of 11%. But six months into the tax cuts, the capital investment boom has not materialized. Planning is not done overnight, so the lag is not conclusive, but instead of at least a modest uptick, new orders for durable goods such as plant-floor machinery, construction gear, etc. declined for the two most recent months. The uncertainty of President Trump's ever-expanding tariffs assuredly must be causing U.S. industry to pause. Skeptics knew what would happen. They remembered what corporations did with a cash windfall when President Bush gave foreign profits a "tax holiday" in 2004. Money repatriated from abroad, meant to create jobs, instead saw corporations use it to buy back their own stock. As they foresaw, that's exactly what has happened with the Trump tax cuts. In the six months since they took effect, major American companies such as Apple, Wells Fargo and McDonald’s have embarked on a spree of buying back nearly $680 billion of their own stock. Retiring stock divides the value of a company by fewer shares, increasing each share's value. Who benefits? The CEO, upper management and directors of those companies. They're paid largely in stock and options. They use billions in shareholder money to enrich themselves. Whereas corporate profits have increased at an annualized rate of 6.5 % since 2009, workers' share of the national income has steadily declined. Much show was made of one-time bonuses paid by corporations when the tax reform package was signed, but ongoing wage increases cost far more and, with a few exceptions, companies have shown little inclination to give America a raise in return for their gift of hugely reduced taxes. Yet there was Vice President Mike Pence in Tennessee in late July boasting that "six million have already received bonuses or pay raises or bigger benefits". That's a mere 3.7% of the 161 million U.S. workforce. The long campaign to virtually eliminate unions has been won, so employees have no unified way to demand higher pay. 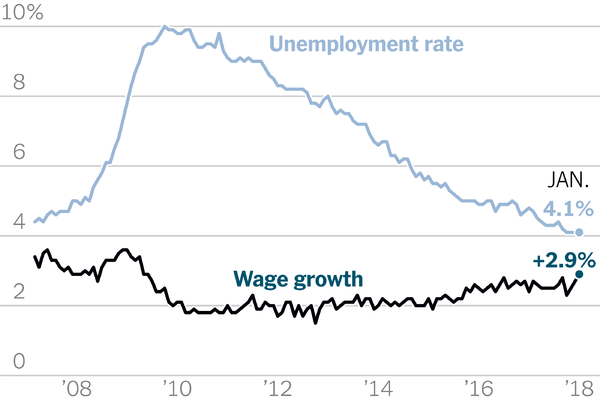 Only low unemployment introduces competition for workers, so paychecks have risen somewhat  2.6% since a year ago, 2.9% in our chart. But inflation has wiped out even those gains. The Labor Department says the Consumer Price Index has increased 2.9% over the last 12 months. caused by the President's tariff war  one-time "doomsday prepping" by corporations spending heavily to stockpile commodities and intermediate goods and (the red band in the chart) onetime stockpiling by China of soybeans, both before tariffs and their higher prices kick in. The question is whether his tariff war will cause the disappearance of 4% GDP gains henceforward because of the repressed economic activity that higher cost manufacturing raw materials will bring. It should be interesting to watch, but not for those who could see their jobs evaporate. The United States has a huge gap in wealth between the top and the bottom which continues to get worse. The bottom 90% of the U.S. population possesses 20 % of the wealth. The top 0.1 % possesses 20% of the wealth. The last time wealth was this concentrated was on the eve of the great depression. All those people living on the streets are not there by choice and a lot of people are very close to joining them. Corporate income tax represents double taxation – once on the corporate profits, and again on the dividends. How is that “fair”? Also, consider this: the corporate income tax is a hidden tax on your pensions. Your pension funds invest in corporate stocks. They rely on the dividend income to pay your pensions.